It's been longer than I wanted for an update, I will try to get more frequently posting. 2015 has been a busy start to the 3D Printing year. More shows, machines and materials releases dominate almost every single week of the calendar. 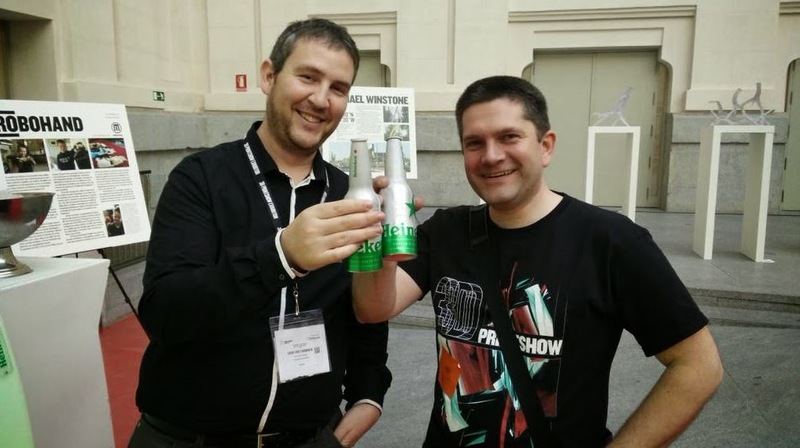 I recently visited the Madrid and Berlin 3D Printshows. 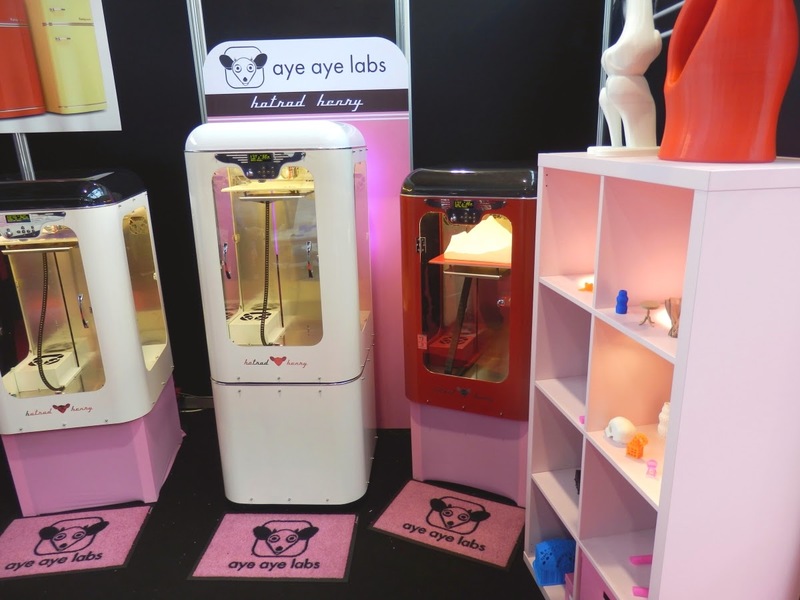 These shows are now attracting a lot of different exhibitors and also a very wide variety of user interested in learning more about 3D printing and it's uses. The questions from people or all ages and backgrounds are fascinating, we are definitely moving forwards with understanding of 3D print technology and it's current capabilities. The biggest observation I can make is that the low-end desktop market is being left behind and the gap between professional machines and services is getting ever wider. When you look at the ever increasing applications of 3D printing that are being exploited many are beyond the capabilities of desktop machines. 3D Selfi's and mini-me prints are being produced in full colour sandstone or with Mcor based Iris paper printers. People expect this, not a single colour plastic model with low detail. Mass customisation is quickly being taken seriously by big businesses, and the use of 3D printing is a channel to unique gifts and value added services beyond the mass market one-size fits all. I do think we are reaching a saturation point with desktop 3D printers. And while new technologies like Carbon3D offer slightly different directions and speed enhancements, the lack of full colour and materials other than thermoplastic's is going to continue to hold us back. Extremely low cost machines keep on appearing, and disappearing... time will tell if these constant attempts to 'break the mass market' do more harm than good. I'm not so sure, the eco-system is still not quite ready I fear. (Sorry for the total lack of images below - I'm just trying to get this long overdue update published before April 1st so you don't think it's a Joke!) - It's not! Paste Extruder V4 - Large capacity and both heated and cold paste material printing. Exciting stuff. The resurrection of a filament manufacturing machine (filament extruder) - An unhappy (almost dead) and under-powered Extruderbot was very kindly donated by the Fantastic 3D Filaprint team, it was fun to re-engineer and re-build and allows me now to experiment with composite materials, blends and some more unusual ideas. An exploration in Resin 3D printing - I have made a number of experiments and designs for a RepRap Resin printer called 3DRip - lots more on this, it's still in development so I plan to post all the success and failures too of getting it running. Lots of new directions to take this too, faster and higher quality printing. Experiments with Wax printing - Just started this one. I'm looking for anyone that's interested in wax as a 3D printing material. It's amazing stuff and I think we can do a lot more with it - let me know if you want to collaborate. Lots of materials - New materials continue to pour onto the market. I'm testing as many as I can. Part 2 of 3D Printing bed materials - I have some new materials to try out and I finally bought a sheet of BuildTak material at the Berlin show. I have heard good things to looking forward to testing it out. 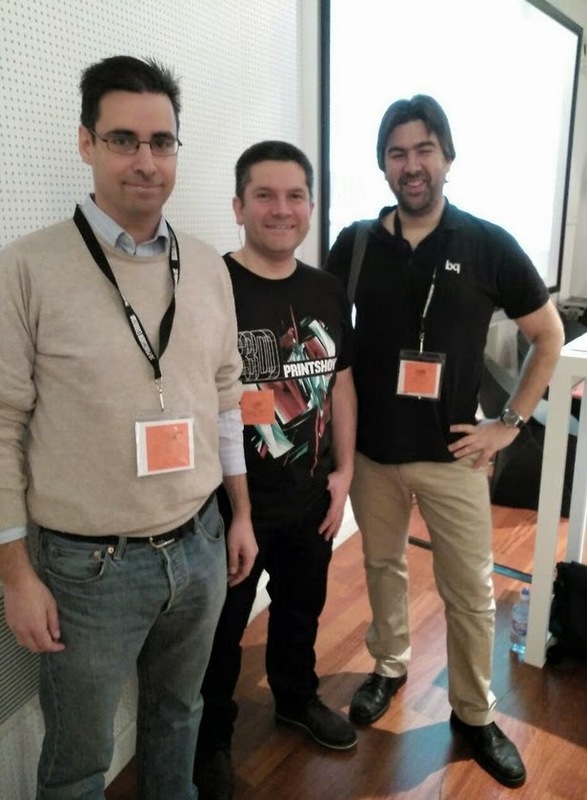 I also finally met with other members of the 3D printing community who I have wanted to meet for such a long time. (Lots more people I didn't get a picture with, I will be more organised next time). 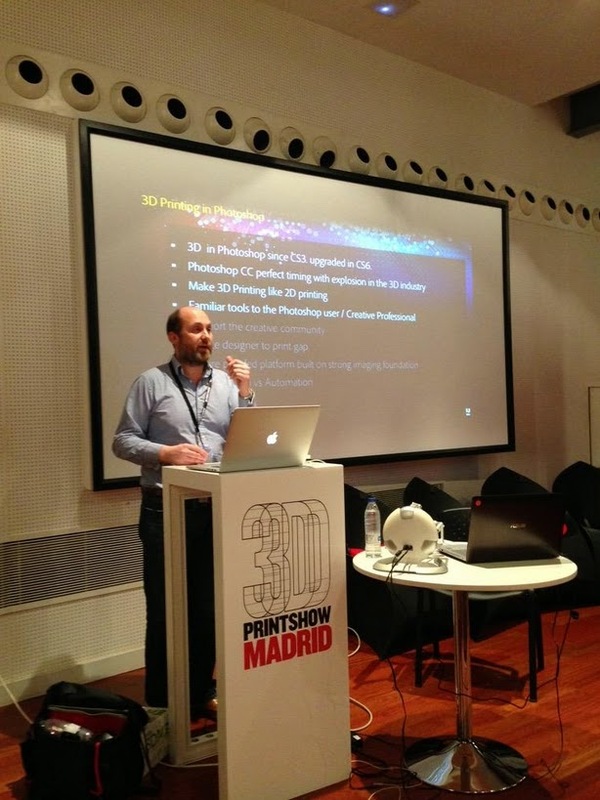 Richard Curtis - Adobe - Presenting the 3D Printing capabilities of Photoshop CC - It's mighty impressive too. The shows were very good, and definitely the best way to meet people and discuss ideas. I will post more about the shows, machines and people I met, but for now this gives you a taste of what's to come this year. Hopefully I'll meet more of the community and get to discuss 3D printing development over a beer or two. I'm also planning to be back in Barcelona real soon to meet many more of you :) - More on that shortly. It's not all just fun :) Lots of background work goes into making these events packed with high quality installations, talks and products on show. 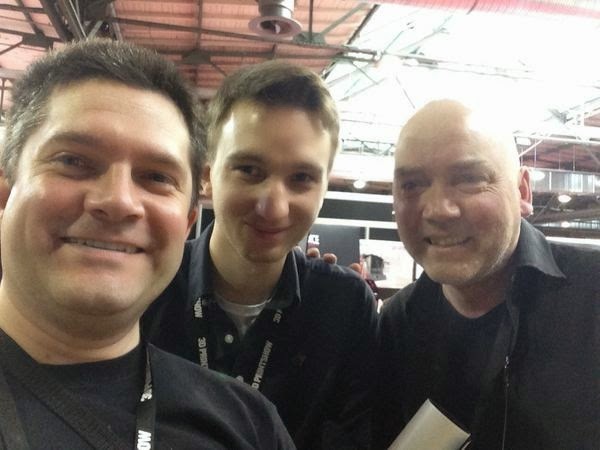 Thomas Sanladerer caught up with me at the Berlin 3D Printshow for a discussion on current technology and what's new. That question actually totally stumped me, and I was surprised how hard it was to point out actual new innovation or development going on in the desktop market. So much that it made me really ponder where we would be in the next 5 years. More on that in a future post. 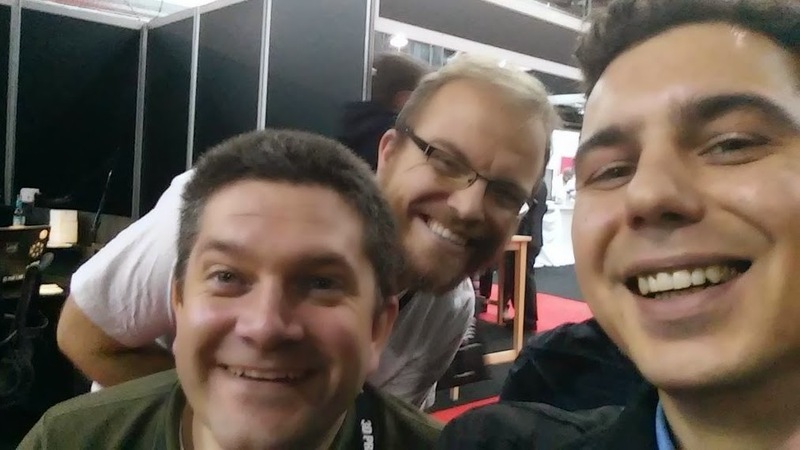 Here is Tom's video - and before you ask - I was thinking 'Ultimaker' & 'Printrbot' and it came out as Makerbot ! I'm sorry... Catch Tom's Youtube channel here for lots more 3DPrinting videos. The Midwest RepRap Festival (MRRF 2015) was going on over in the US (Goshen, IN) organised by SeeMeCNC, and sponsored by many great other companies and communities. I'm really disappointed to have missed out on going over, but the timing and time off work just was not on my side this year. This video from E3D is a great intro to the amazing and complex task of making a production extruder hot-end (that actually work well). The guys at E3D are world leaders in this area and actually do research, testing and devote both their awake time and dreams to making the worlds best hot-ends. 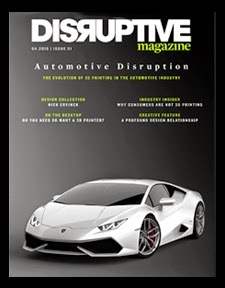 I'm also writing articles for the newly launched Disruptive magazine, you can download and read the very first issue here. - Let me me know what you think, good and bad. The main aim is to cut out the hype and talk about both 3D printing and it's uses in a calm and sensible way. 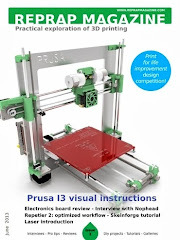 So you won't find any "Worlds first/smallest/fastest 3D Printed (insert anything)" headlines in the magazine or on the disruptive website - we all have enough of that already. 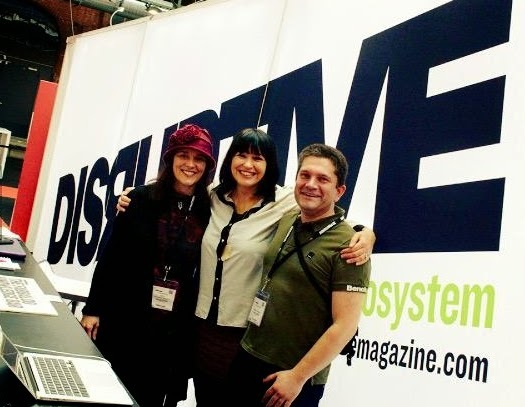 And a quick shout out to one rather fantastic new 3D printing company was at the Berlin 3D Printshow. Showing what can only be described as a 1960's 'Hotrod Fridge' with a 3D Printer inside. This was Aye Aye labs - From Poland. A new startup with design flair and inspiration from classic Hotrods and American diners of the 50's and 60's. I'm sure Aye Aye labs are going to find their market and do very well in the coming months. I'll be at the London 3D Printshow if you want to say hello or discuss 3D Printing, look out for the Disruptive Knowledge bar and Makerspaces.